This item is expected to ship 4-6 weeks after the event on July 15, 2019. Clients dealing with trauma aren’t always receptive to the therapeutic process. And using treatment techniques that repeatedly confront clients with the horrific details of the traumas that haunt them can cause them to be avoidant, reactionary, or completely withdrawn. It’s painful for the client and clinician alike, and it doesn’t feel like healing. In this EMDR Certificate Course, you'll learn proven skills and techniques from this powerful, evidence-based treatment that will allow you to safely and rapidly help your clients’ process their traumas and reclaim their lives! And since EMDR doesn’t require a focus on explicit details, your clients will be able to make remarkable therapeutic progress without having to relive every aspect of their nightmares. This intensive course will empower you to take your trauma treatment to the next level with the tools you need to help your client manage disturbing feelings, safely reprocess their traumatic memories, reduce fears and anxiety, and develop the resources they need to achieve and maintain recovery. Discover how EMDR skills and techniques can make your sessions life-changing, and allow you to bring rapid, safe and effective relief from trauma to your clients! Establish the role of the autonomic nervous system in trauma symptomology. Articulate the clinical implications of the freeze response in trauma treatment. Characterize the potential neurobiological mechanisms of change in the empirically validated EMDR approach. Specify how EMDR techniques can build dual awareness in clients to treat the avoidance that makes trauma treatment challenging. 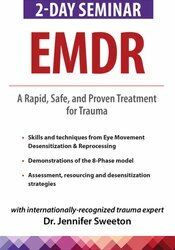 Communicate the 8 Phases of the EMDR protocol. Determine which clients you should use EMDR with. Analyze resourcing strategies from EMDR that clinicians can use to help facilitate the processing of trauma. Characterize how EMDR techniques can be used to reinforce and activate positive neural networks. Communicate how EMDR can be modified to work with complex/developmental trauma to directly treat traumatic memories. Evaluate strategies that can help foster the critical connection between client and therapist in EDMR therapy. Articulate the research limitations and potential risks associated with EMDR. Establish the order of operations for attachment-based EMDR treatment to resolve relational trauma. Dr. Sweeton resides in the greater Kansas City area, where she owns a group private practice, Kansas City Mental Health Associates. She formerly served as the president of the Oklahoma Psychological Association, and holds adjunct faculty appointments at the University of Kansas School of Medicine and the University of Oklahoma Health Sciences Center. Dr. Sweeton offers psychological services to clients in Oklahoma, Kansas, and internationally, and is a sought-after trauma and neuroscience expert who has trained mental health professionals in workshops throughout the country and abroad. She is also the author of Trauma Treatment Toolbox: 165 Brain-Changing Tips, Tools & Handouts to Move Therapy Forward (PESI, 2019). Nonfinancial: Jennifer Sweeton has no relevant nonfinancial relationship to disclose. This workshop is intended for masters – and doctoral-level clinicians experienced in working with trauma. Participants will leave this workshop with the theoretical knowledge of the current trauma paradigm as well as the practical “hands on” experience of participating in EMDR for resourcing and reprocessing trauma.